I was a little bit nervous. I noticed myself checking my make-up in the rearview mirror, and straightening my clothes obsessively. I’d waited all week to meet him. My hour was arriving and I wasn’t exactly sure what to expect. This man is a legend, and I know everyone wants him. His origins are argued over, and remain part of his mystery. However, the mystery isn’t necessarily reason enough to be nervous. It’s the things he knows, the things he’s seen, and my thirst to know them. I want him to share with me, and let me in on his secrets (which I think he hides in his beard). I want him to tell me what he saw in the Bermuda triangle, or where the holy grail rests…I’m sure he’s the only one that knows. Most of all, I want to capture his spirit, and walk the streets of my own town with him, seeing it through the eyes of a legend. If he’d only let me loop my arm in his, and go for the ride. 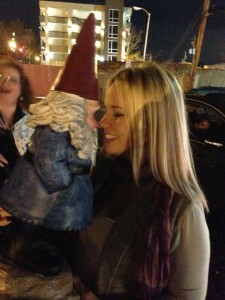 I feel like a schoolgirl, and I know now it’s official…I have a crush on the Travelocity gnome. I met him on a darkened street corner after barely missing him at Hi-Wire Brewery (where I hear he got a little tipsy). I was coming to meet him, but wasn’t quick enough, and that gnome, in his little nomadic nature, is like taping pudding to the wall. He’ll just slip away without warning and slide into unmarked crevices. However, like ships in the night we passed briefly again. I found him stumbling down a sidewalk fresh off the dance floor at Scandals. He claims he was only there for Zumba lessons, though I wasn’t sure. However, I didn’t ask many questions, but just stretched out my arms. I knew we had but minutes. That famous portly creature leapt into my yearning embrace, and for a moment he was mine. I could smell the history on him like a thick French musk. His face and body had definitely taken a couple licks through the years, and he was wise to things I have no knowledge of yet. I felt honored to meet him, and perhaps more honored that he’d been drawn like a moth to a flame to this town. The magnet that is Asheville, NC, composed of quirk, beer, Southern Charm, beer, cultural diversity, beer, and an unparalleled charisma is now part of the patchwork quilt that makes up the adventures of this world-renown gnome. Now I think the real crush I have is just on Asheville. After all, Asheville drew the gnome.